Photo by katiesaba via Flickr. 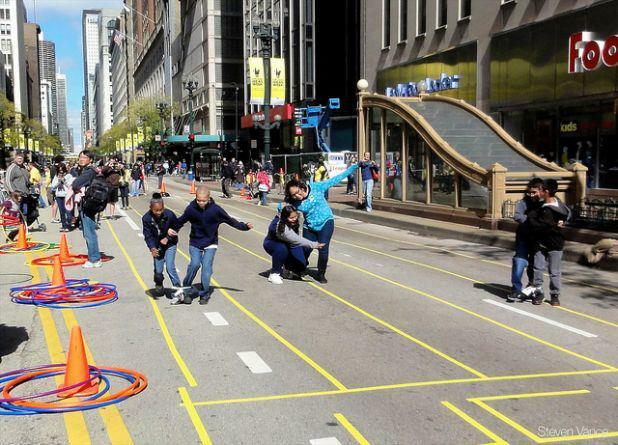 Look at all the fun to be had at this year’s Open Streets Chicago event! Inexpensive transformations of our largest public spaces (our city streets) turn concrete slabs built for cars into playgrounds for the entire city. Eagle Street Beach Party and Fiesta. Photo by iBerkshires. This past July, Eagle Street in North Adams, Mass. was transformed into a beach with beach balls, pails, shovels and 250,000 pounds of sand. 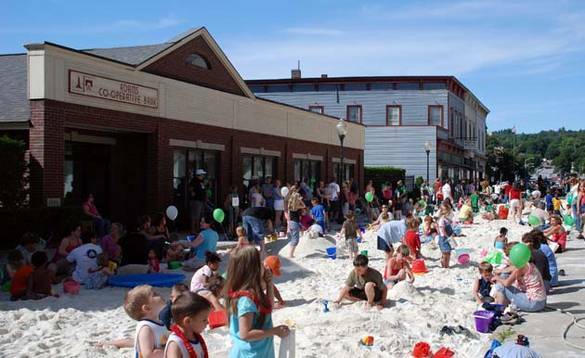 The Eagle Street Beach Party, a free event which started in 1999, is organized by the North Adams Office of Tourism and Cultural Development. Local vendors give away prizes for creative sand castles an sculptures, and food and music cap the day. An innovative way to transform a public space in to a surreal and delightful playground. Cities like New York and San Francisco have lead the way in the transformation of our largest public space, our city streets. They have successfully created comfortable, vibrant and welcoming public plazas constructed efficiently and inexpensively by using paint and temporary materials. These plazas can help calm traffic (decreasing incidents of pedestrian and cyclist injury and fatality), encourage walking and cycling (contributing to personal and public health through exercise and the decrease of carbon emissions from cars), and can benefit local businesses (because when you create an attractive space, people are more likely to linger and patronize nearby shops and restaurants. The hallmarks of these public spaces are their location (converting redundant or wide streets in areas that already have high levels of commercial, pedestrian or cyclist activity), their customizable nature (moveable seating and chairs are always preferable because you can feel comfortable to sit alone or in large groups), and their accessibility (no stairs, adjacent to crosswalks and sidewalks, lots of seating options, shade and visibility). 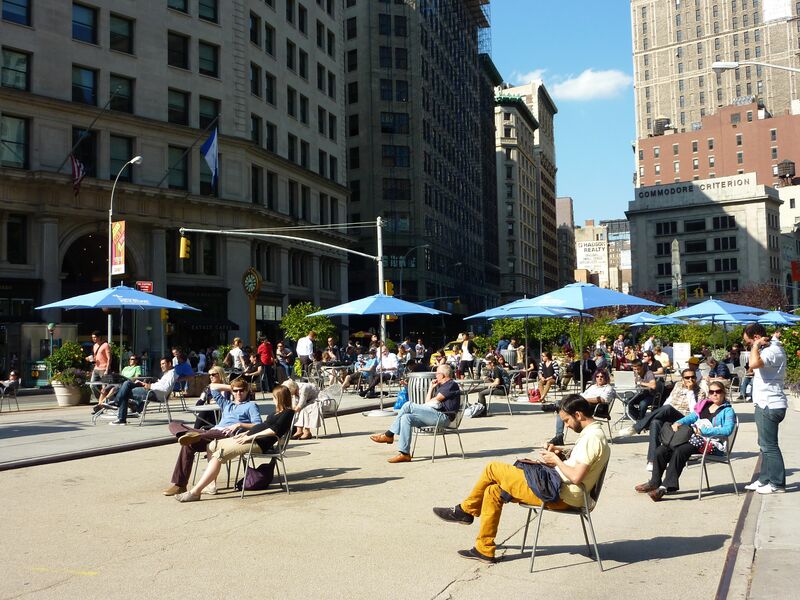 Los Angeles, with it’s warm weather, wide boulevards and high levels of pedestrian activity in certain neighborhoods could be a perfect playground for these types of public spaces. 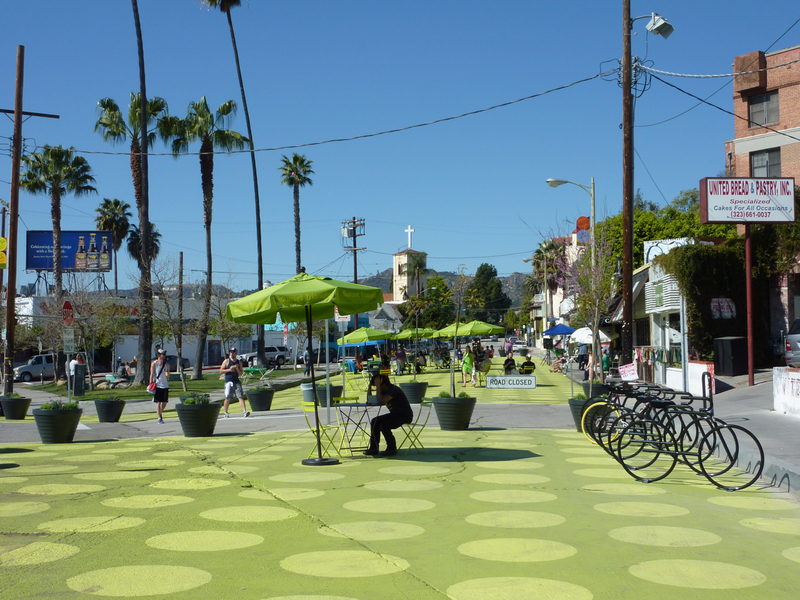 Last year the Los Angeles Department of Public Health received a grant to decrease obesity rates in Los Angeles and together with the Department of City Planning, they decided to put that money towards Los Angeles’ first street-to-plaza conversion project. Spearheaded by Streets for People, Frank Clementi of Rios Clementi Hale Studios, and the Los Angeles Departments of Transportation, Planning, Public Works and Public Health; along with the local council office and local community and non-profit groups, Sunset Triangle Plaza was officially opened on March 4th. This particular location was chosen because a) the community had been asking for a pedestrian plaza in this area for over 10 years, b) there was already a twice-weekly farmer’s market in this location so the street already had consistent pedestrian activity; and c) as previously mentioned, the street is redundant and sandwiched between a small triangular park and popular businesses whose patrons were usually crowding the tiny sidewalks with bicycles and belongings. Sunset Triangle Plaza is a one-year pilot project. Early next year community members, city agencies and elected officials will determine whether or not the plaza will become something more permanent or be converted back in to a street. Street-to-plaza conversion projects can be hard to visualize if you’ve never seen or experienced one before. The wonderful thing about creating temporary demonstration projects is that they allow a city to inexpensively transform public space so residents can see for themselves just how transformative these types of spaces can be. Sunset Triangle Plaza from Streets for People on Vimeo. 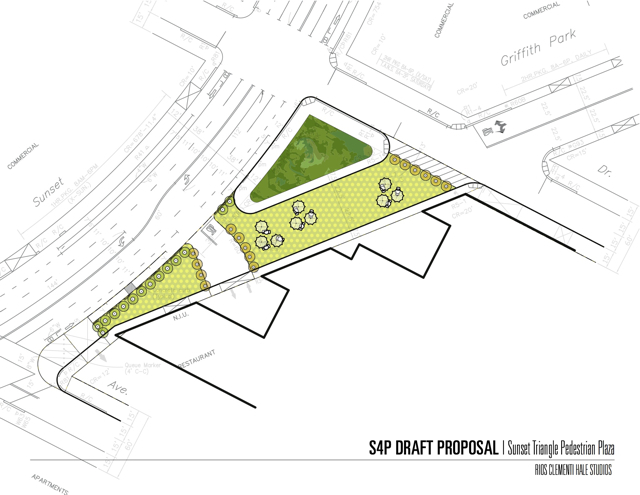 Sunset Triangle Plaza design by Frank Clementi of Rios Clementi Hale Studios. Sunset Triangle Plaza opening day video by Joel Schroeder.